There are many brands of kids’ “gummies” on the market. They are promoted as deliciously flavoured and a great way for growing bodies (and fussy eaters) to get the nutrients they need. The “active” ingredients are usually listed as vitamins, minerals and sometimes omega-3 fats and vegetable powders. They may say “contains sugars” or they may not. Rarely, some list an amount of sugar and other ingredients such as food acids like citric acid, lactic acid and ascorbic acid. In our opinion, these products are unhealthy and exploitative. Their high sugar content may appeal to young children, but they’re not a good introduction to a healthy diet. Dental caries are a significant Australian public health problem. In 2014-15, A$9.5 billion was spent on dental services in Australia, up from $6.1 billion in 2007–08. In Australia, around 50% of children start primary school with largely untreated cavities. In Victoria, 7.1% of children aged under 12 have had a general anaesthetic for dental treatment. Sugars provide food for the bacteria that dissolve tooth enamel. As sugar consumption increases, so do cavities. 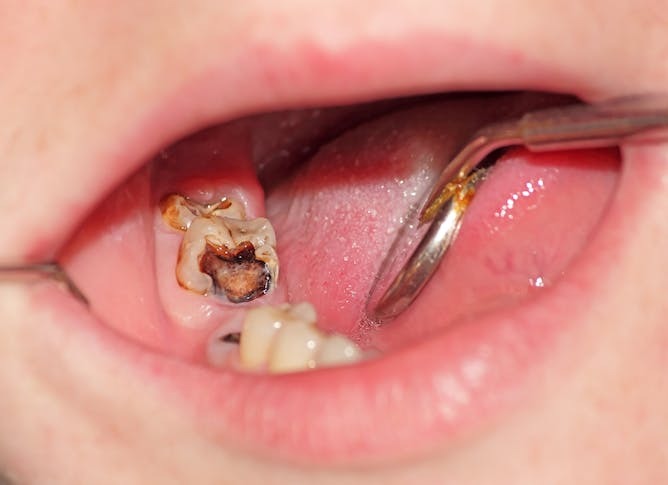 This damage is irreparable and individuals are left with life-long problems that require fillings, and possibly root canal work or extractions. In addition, food acid (especially citric acid) causes dental erosion that can lead to the progressive loss of the surface of the tooth. This may require complex and lengthy treatment involving fillings, veneers and crowns. The sticky consistency of “gummies” adds to the problem. The World Health Organisation (WHO) says higher rates of dental caries occur when the intake of free sugars (added sugar plus honey, syrups and sugars in fruit juices) is more than 10% of total energy intake. This is despite fluoride in drinking water and using toothpaste. Dental caries rates decline progressively as sugar intake is reduced to less than 5% of total energy intake. Hence, for a range of health reasons, the WHO recommends we get no more than 5 to 10% of our daily energy from free sugars. So, two- to three-year-olds with a daily energy intake of 4,300 to 5,450 kilojoules (kJ) shouldn’t consume more than a maximum 430 to 545 kJ, or about six to eight teaspoons (25-32g) of free sugar a day, and preferably half that amount. And four- to eight-year-olds, with a daily energy intake of 5,700 to 7,100 kJ, shouldn’t consume more than 570 to 710 kJ, or about eight to ten teaspoons (33-42g) a day, and again, preferably half that. Contrary to this advice, 50% of Australian children aged two to three, and 67% of four- to eight-year-olds, consumed more than 10% of their total energy from free sugars in 2011-12. The top 10% of two- to three-year-old boys consumed 18 teaspoons (70g), rising to 23 teaspoons (90g) in the top 10% of four- to eight-year-olds. Part of the problem is there is currently no clear way of knowing how much sugar has been added to a product (including gummies) by looking at the ingredients listed on the label. Choice (the Australian Consumers’ Association) is campaigning for food and health ministers to act on added sugar labelling so consumers can limit their consumption, as advised by the WHO and other authorities. “Gummies” also exemplify the problem of regulating products at the food-medicine interface. Some of these products, such as the Kids Smart Vita Gummies above, are listed with the Therapeutic Goods Administration (TGA) as complementary medicines. For complementary medicines, there is a requirement to declare the presence, but not the quantity, of sugars on the label. For no apparent reason, other “gummies” such as Bioglan Omega 3 Fish Oil Kids Gummies have not been listed with the TGA and may be classified as foods by their sponsor. For food, there is a requirement by Food Standards Australia New Zealand (FSANZ) to disclose the total content of sugars on the nutrition information panel on the product label. The Bioglan website states each bottle of 60 gummies contains 168g of product; an average serving is two gummies (5.6g), which the formulation states have 3g sugar (54% by weight). They also stated there was 3mg of sugar per 100g of product which is clearly mislabelled; 100g of product must contain 54g of sugar, not 3mg. Using the TGA Food-Medicine Interface Guidance Tool, we determined this product was a food, so we sent a complaint about mislabelling to the NSW Food Authority. However, they advised us to send the complaint to the TGA. The TGA response ignored our concern about mislabelling. We also asked why there were different sugar labelling requirements for foods compared to medicine. 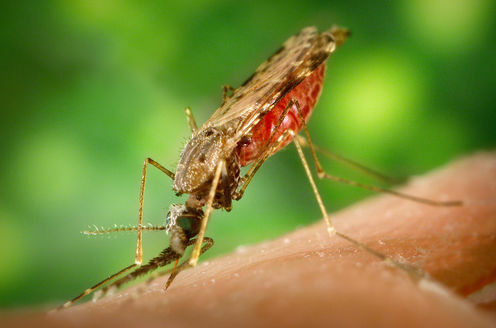 The TGA stated the warning statement, “contains sugar”, serves as an advisory without unnecessarily deterring general consumers from taking a medicine they may need. It is our view “gummies” that contain food acids, and have a high sugar content, are not medicines consumers need, and their sale should be prohibited on public health grounds. At the very least, the amount of sugar (and the presence of food acids) should be disclosed. In addition to the high and damaging sugar content, we argue these are exploitative products that mislead consumers about the benefit of dietary supplements. 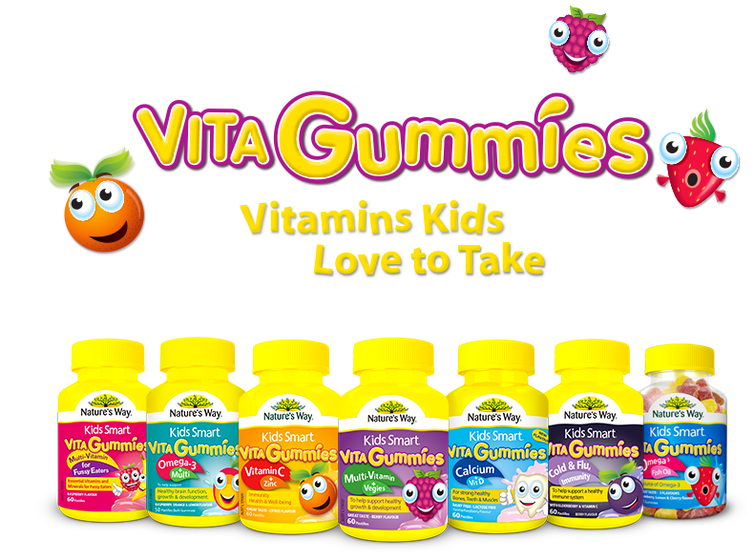 Both the website and the label of Kids Smart Vita Gummies Multivitamin for Fussy Eaters say the zinc content will boost the appetite of a “fussy eater”. Zinc is readily available in foods such as meat, fish and poultry while cereals, grains and dairy foods also contribute substantial amounts. We are unaware of any evidence that zinc boosts the appetite of “fussy eaters”. Kids Smart omega-3 supplementation claims “to help support brain function, growth and development”. The US Food and Drug Administration recommends eating oily fish two to three times a week. They do not recommend taking omega 3 supplements, reflecting findings that randomised controlled trials of fish oil supplementation have generally been disappointing and fish contain many more nutrients than omega-3 supplements. Gummy vitamins are unhealthy and exploitative products that mislead parents about the benefits of dietary supplements. The TGA and FSANZ should urgently review the regulation of these products. Ken Harvey has represented Choice (the Australian Consumers’ Association) on TGA consultations about regulatory reform of complementary medicines. He is also an executive member of Friends of Science in Medicine. Stuart Dashper receives funding from the National Health and Medical Research Council of Australia and the Oral Health Cooperative Research Centre. Eliza Li and Rosemary Stanton do not work for, consult, own shares in or receive funding from any company or organisation that would benefit from this article, and has disclosed no relevant affiliations beyond the academic appointment above.